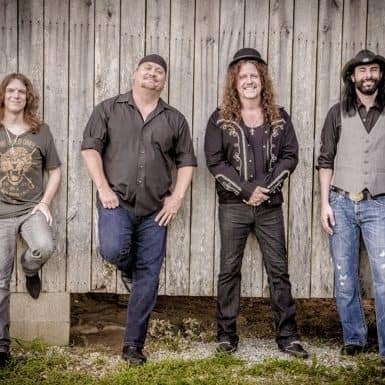 Skinny Molly was founded in 2004 by guitarist/vocalist Mike Estes (formerly of Lynyrd Skynyrd and Blackfoot), Dave Hlubek (founding member of Molly Hatchet) and Nashville, TN studio drummer Kurt Pietro. Originally put together to do a one-off tour of Europe in 2004, Skinny Molly has, thirteen years later, become one of the hardest working and popular rock bands to come out of the southern United States. Solidifying the current lineup in 2007, the band boasts guitarist Jay Johnson (formerly of Blackfoot/ Rossington Band), and Grand Ole Opry stalwart bassist Luke Bradshaw. This lineup has toured relentlessly; their first jaunt found them crossing three continents in 30 days on the strength of their debut CD “No Good Deed”, Constant gigging has established them as “The band from the South to see” at festivals and clubs across Europe as well as at home in the States. In 2012, word of their incendiary live shows reached Ruf Records president Thomas Ruf, and Skinny Molly immediately embarked on recording their first CD for the label, “Haywire Riot.” “Haywire Riot” bordered on a southern gothic gumbo sound, while retaining Estes’ dark lyrics about lost love, redemption and the freedom of life on the road. After amicably parting with Ruf in 2014, the band set out to record their best blast of “Southern Rawk” as Estes calls it, the aptly titled “Here For A Good Time”. The CD is a collection of songs that the band thinks is their best yet. “Here For A Good Time” is sure to please fans of a number of genres; Southern Rock, Rock, Country, Blues, and Americana fans will all find more than a little something to love about this CD. In 2015, Skinny Molly released it’s first ever DVD, “Skinny Molly Live at the Shed” which shows the band at it’s lean and basic best, captured live with only one technical fix on one song. The DVD shows why the band is finally getting the accolades and bigger audiences it deserves, playing the huge “Rock the South” Festival and headlining 6 more festivals in Europe in 2016. This year, the band will rock even more fans this summer, playing festivals across the USA, Germany, France, Italy, Czech Republic and the UK.